In 2017, The Clarice in partnership with MilkBoy Philadelphia and the University of Maryland College Park Foundation opened MilkBoy ArtHouse, a local crossroads for dynamic entertainment, inspired social gathering and creative dining. 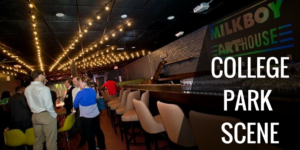 MilkBoy ArtHouse has two performance spaces and an art gallery in a friendly setting with eclectic cuisine and boundary-breaking artists that reflect the diversity of College Park, our county and our region. Learn more about this vibrant arts space. The Visiting Artist Series curates a multi-arts performance series with regional, national and international artists and creative innovators who present work in contemporary dance and theater, chamber music, jazz, global music, new music and puppetry. Through performances on stage, extensive campus and community engagement programs, creation residencies and a commitment to commissioning new work, the Visiting Artist Series creates exciting connections and opportunities for the community to participate and engage in a world of discovery and exploration. Your contribution will support the Visiting Artist Series at MilkBoy ArtHouse that includes performances in jazz, contemporary and world music, and theater. By donating you help us create opportunities for community arts organizations and artists to access an amazing space for art making. With a donation to the College Park City-University Partnership to support creative arts programs at MilkBoy ArtHouse, you may be eligible to receive a Maryland tax credit equal to half the value of your donation. The Partnership has $20,000 in tax credits available for Maryland businesses and residents. You can also send a check. Please address the check to the “College Park City-University Partnership”. Please note the donation is for Arts Programs. Our mailing address is 4500 Knox Road, College Park MD 20740. Please contact Valerie Woodall, Program Associate at 845-649-2477 or vwoodall@collegeparkpartnership.org with your intent to donate.